Coming to stores this week: a new, souped-up Xbox 360 system to match that hands-free Kinect controller adapter due Nov. 4. Attendees at the Electronic Entertainment Expo here expected Microsoft (MSFT) to show off its new Kinect device (no price yet), which enables players to play video games using their bodies and voices in lieu of standard video game controllers. But the software giant and video game maker Monday also revealed a slimmer Xbox 360 game system priced at $299, same as the current model. The new model increases the hard drive space to 250 gigabytes – twice that of the current one – and includes built-in Wi-Fi capability. Current Xbox models need an accessory to access Xbox Live and other online features wirelessly. The redesigned device, expected to be available at retailers later this week, is smaller and “whisper quiet,” says Don Mattrick, the company’s senior vice president of interactive entertainment. The new Xbox is “completely designed for the future of entertainment,” he says. Microsoft also announced a deal with ESPN to deliver free access to more than 3,500 live sports events (college and pro football and basketball, Major League Baseball) annually for Xbox Live subscribers. Live costs $50 per year. 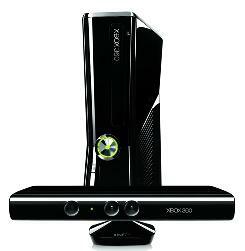 The revamped Xbox 360 – combined with launch of Kinect, formerly named Project Natal – might help Microsoft in the competitive $20 billion video game industry. “They are taking their console, which has primarily been a core gaming outlet, and transforming it into an entertainment hub the whole family can enjoy,” says Jesse Divnich of Electronic Entertainment Design and Research. Since the November 2006 release of the Wii, Nintendo has dominated the casual and family video game market selling 28 million Wiis, according to market tracking firm The NPD Group. Microsoft has sold about 20 million Xbox 360s; Sony, 12.3 million PlayStation 3 systems.